These nachos are entirely vegan and perfect for sharing...if you want to. 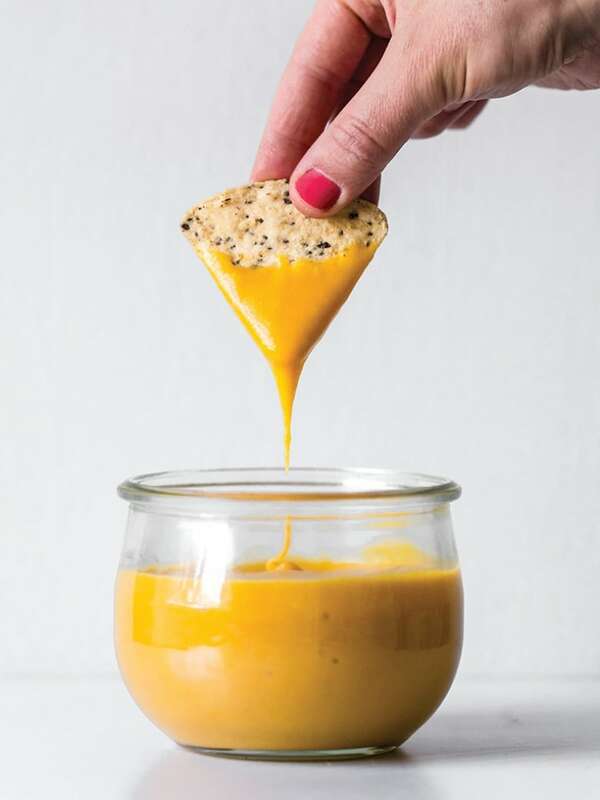 This cheese sauce from Angela Liddon’s Oh She Glows Every Day will satisfy even the biggest skeptics. No artificial ingredients required, it’s actually the potatoes that give it that stretchy texture, while the cashews make it super rich — all combined to make one tasty topping that is just begging for a plate of Chili Cheese Nachos. Here it is: my favourite vegan “cheese” sauce that not only tastes amazing, but can be used in a wide variety of dishes! Who knew that just a few simple ingredients could create such a decadent, silky, pourable sauce? No, it isn’t a dead ringer for traditional cheese sauce, but we think it’s comforting in its own right. Use it in my Chili Cheese Nachos or Mac and Peas, or heat it up and use it as a nacho dip paired with salsa or as a spread on a wrap. It’s also fantastic drizzled over roasted or steamed broccoli or cauliflower! I love to add my favourite Sriracha sauce to this to really amp up the flavours. A big thanks to Jennifer Houston and Ruth Tal’s Super Fresh cookbook for inspiring this versatile and wallet-friendly recipe! 1. Soak the cashews in a bowl of water overnight or for at least 1 hour. Rinse and drain. 3. Transfer the cashews, potatoes, and carrots to a blender, add the nutritional yeast, coconut oil, water, lemon juice, ½ teaspoon of the salt, garlic, and vinegar and blend until smooth. If using a Vitamix, use the tamper to help it blend. If it’s too thick, you can add another splash of water or oil to help it along. Taste the sauce and add Sriracha and more salt, if desired. The sauce will keep in an airtight container in the fridge for up to a week. It’s important to dice the potatoes and carrots small before measuring (about 1/2-inch/1 cm pieces); I recommend weighing the potato and carrot for the most accurate measurement. Simply omit the cashews. It won’t be quite as rich, but it still tastes great! Excerpted from Oh She Glows Every Day: Quick and Simply Satisfying Plant-Based Recipes by Angela Liddon. Copyright © 2016 Glo Bakery Corporation. Photography by Ashley McLaughlin. Published by Penguin Canada, a division of Penguin Random House Canada Limited. Reproduced by arrangement with the Publisher. All rights reserved.